Most Americans don’t know much about our 23rd commander-in-chief. Furthermore—adding insult to injury—many of the things for which Benjamin Harrison is remembered have little or nothing to do with his actual achievements. He famously interrupted Grover Cleveland’s non-consecutive terms. His opponents called him “Little Ben” due to his 5’ 6” stature. And his grandfather, William Henry Harrison, was also president...albeit one who kicked the bucket after just 31 days in office. 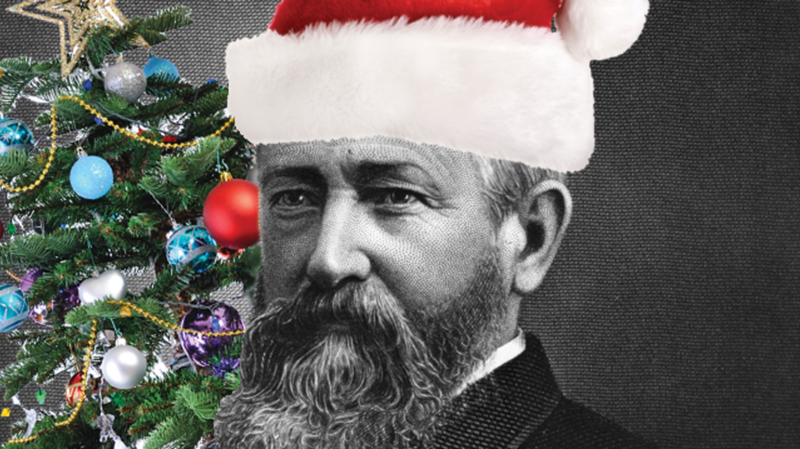 Yet Benjamin Harrison broke lots of new ground and, thanks to some holiday décor, helped establish a festive White House tradition. However, “Little Ben” wasn’t about to let heartache spoil the most wonderful time of the year. After all, his grandkids were spending their holiday at the White House and, as he later said, “I am an ardent believer in the duty we owe ourselves at Christmas to make merry for children at Christmas time”. As Harrison readied the seasonal trappings, he installed something the presidential mansion had never seen before: an indoor Christmas tree. But not every present was reserved for youngsters: on Christmas morning, every single member of Harrison’s domestic staff was summoned to receive some token of appreciation—married men got turkeys and their bachelor co-workers were given choice dining gloves (presumably to be worn while eating out). Harrison also took full advantage of his generous beard by grabbing a red and white costume and prancing about as Kris Kringle himself before an adoring audience.